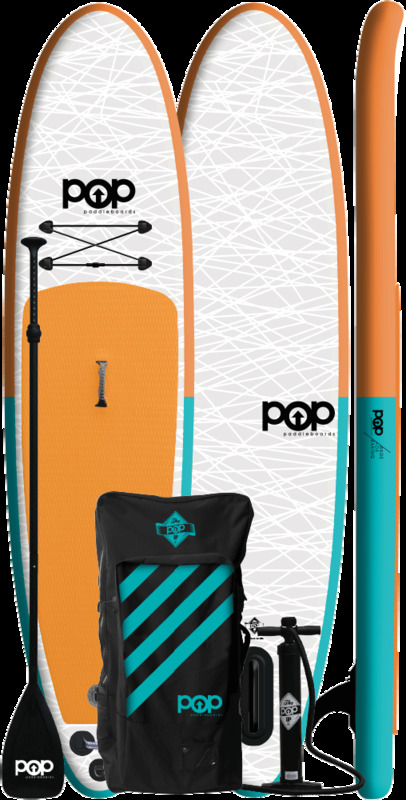 The board includes a backpack, SUP pump, and foldable aluminum paddle for easy carrying and storage when you’re on-the-go. The POP-UP is constructed with drop-stitch technology (the same used on military zodiacs), allowing us to shape them to our custom dimensions while reducing springiness for a stiffer and more stable ride. By the time the board is fully inflated you’ll forget it’s an inflatable board. The POP-UP gives riders an easy-to-carry board that’s lightweight, compact, and durable enough to handle each and every adventure. Because of this, it’s a great board to share with family, friends, and kids alike. 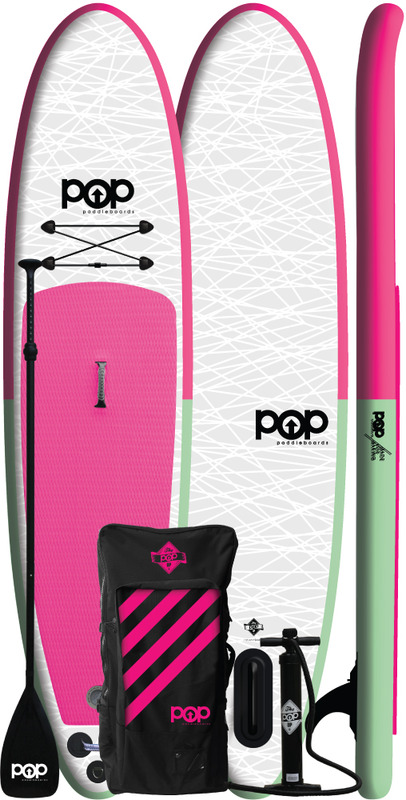 We created the POP-UP to offer all the benefits of a standard paddleboard without any restrictions. You can say goodbye to dings, dents, and other limitations with the POP-UP inflatable paddle board and say hello to a good time wherever life takes you. INFLATABLE SUP BOARD DIMENSIONS Board Length: 11’0″ Board Width: 32" Board Thickness: 6″ Board Volume: 250 liters Board Weight: 23 lbs FUTURES The 11’0 Inflatable features a single fin system designed to slice through the water. Using a large single increases holding power that stabilizes the tail of the board, offering riders complete control and maneuverability over the Americana. Using a single fin also reduces drag on flat water to maximize rider energy, therefore increasing overall endurance and stamina during long distance paddling and racing. 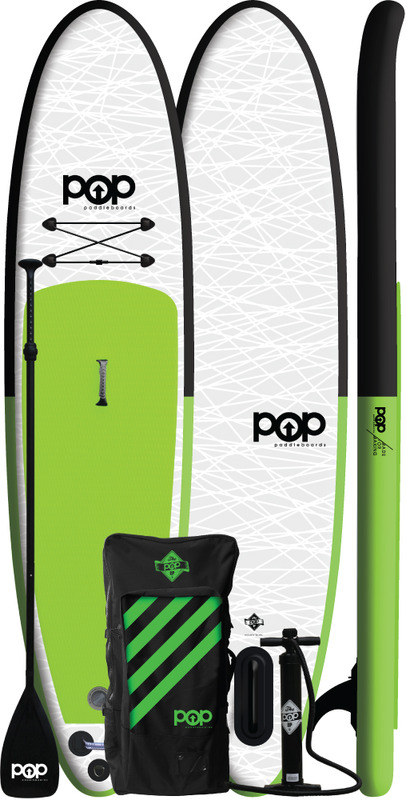 360 DIAMOND TRACTION PADPOP POP Paddleboards’ 360° diamond traction connects riders to their paddleboards with and ultra-tacky grip that’s firm and forgiving. The recessed diamond ridge design provides 360° of grip that keeps riders glued to our boards. Whether you are circling the buoys around the harbor or dropping in on an overhead wave, our trademark pad will allow you to seamlessly pull off the most critical maneuvers. There’s no blaming your next wipeout on traction-pad-slippage with POP’s diamond 360° traction pad. GORTEX VENT PLUG POP uses a one-way military grade vent plug to release heat pressure buildup from the inside of our boards, without letting water in. The materials used in making most paddleboards can expand when exposed to high heat for extended periods of time. This can cause internal warping of the foam core and fiber glass, causing delaminating between the bonding layers of the board. For best results loosen the vent plug when racking your board on a hot day or setting it dockside under the hot sun. HANDLE IT How do you make something that weighs 25lbs feel like 5lbs? Put a good handle on it. POP SUP boards feature our very own ergonomically recessed handles with ribbed finger grips for extra carrying comfort. No more finger cramping, the handle is designed to transfer the weight of the board from your finger tips to your hand and arm. We carefully position the handles on the center of our boards to give riders optimal balance, making our boards feel weightless carrying them to and from the water.